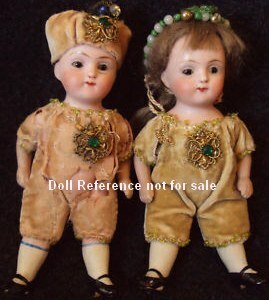 Antique All bisque dolls were made in France 1860 +, Germany 1890 +, Japan 1915 +, and by American doll makers, sizes range from a tiny one inch to fifteen inches tall. Some dolls were made in Germany for the French market. 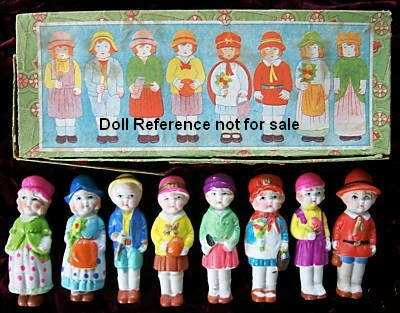 Many of these tiny dolls are only marked with the country of origin, some have a size number or mold number, however, most of the tiny French made dolls are unmarked. 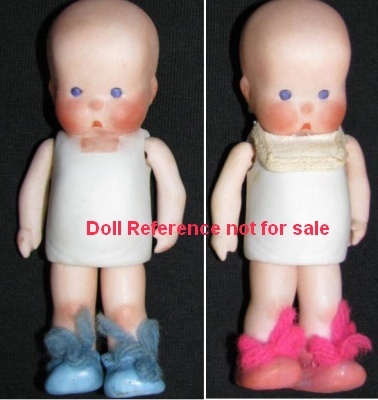 Kid lined jointed all bisque body and head, painted or glass eyes, some have jointed elbows and knees, many have molded painted shoes in various colors or bootines (as shown on right), with painted socks and some dolls have bare feet. Early French Mignonette, all bisque doll, 7" tall, no chips or cracks, solid dome bisque socket head, blue glass stationary eyes, feathered brows, painted upper and lower lashes, wigged, close mouth, kid lined neck opening, bare feet, doll is unmarked. She also has an amazing pair of leather buckle teensy tiny shoes with 0 . 0 marked on bottom sole, socks, mohair wig and pearl necklace. 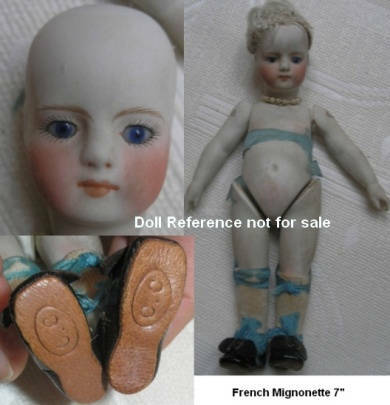 French Mignonette, 5 1/2" tall, all bisque, no chips or cracks, solid dome socket bisque head, blue glass stationary eyes, painted upper and lower lashes, wigged, kid lined neck opening, elongated limbs; arms and legs, bare feet, doll is unmarked. French Poupée de Poche, Mignonette or small pocket doll. 7" tall, all bisque, jointed at shoulders and hips, painted eyes with painted lashes, wigged, sturdy wrestler type legs, painted white socks and black shoes with heels. 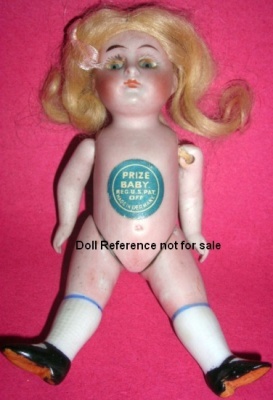 Prize Baby's label has also been found spelled Brize Baby. ebay auction end value $91.00 on 16 May 2011. 4 1/2" tall, all bisque socket head, jointed at neck, shoulders and hips, painted eyes, closed mouth, wigged, sturdy wrestler type legs, painted white socks and tan shoes with heels and two straps, by Bahr & Pröschild, Armand Marseille and an unknown German doll maker. Boy and Girl all bisque dolls shown dressed on left, each is 4 1/2" tall, fixed eyes, closed mouth, see doll at right for doll marking and body style. Strobel & Wilken All Bisque Doll, 9"
Note: Reference books list SWC doll mark as unidentified, we believe it is by Strobel & Wilken, German doll importer, so use your own judgment. Happifat doll, 4" tall, doll based on drawings by Kate Jordan, all bisque, non-jointed, distributed by George Borgfeldt. 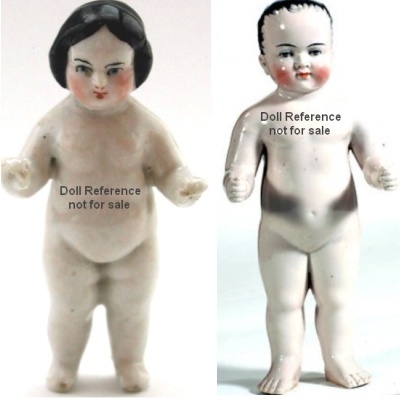 Happifat dolls were made by both K & K Toy and Amberg, whose 10" tall with a cloth body Happifat doll was advertised in 1921 as the Freshie doll. Later Happifat all bisque dolls were made in Japan. 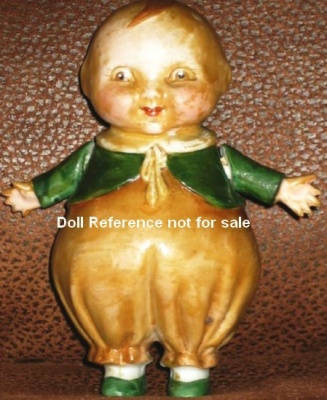 Chubby doll by Louis Wolf, doll marks LWC, L. W. & Co. or S. H. K. & Co. Frozen Charlotte doll 7", Frozen Charlie doll 10 1/2"
Armand Marseille Tiny Tot doll, 2 1/2"
Snow Babies figurine (shown above left), 1" tall, jointed shoulders and hips, German or Japan made. Jeanne Orsini Didi doll, 5" tall, all bisque, jointed at shoulders and hips, wigged, glass eyes, open mouth, tall painted white stockings and painted tan shoes, gold paper label with dolls name on front. 3, 3d, 6, 12, 14, 15, 18, 20, 25, 30, 34, 35, 36, 41, 44, 47, 60, 65, 68, 79, 83, 85, 86, 100, 102, 104, 105, 110, 112, 116, 120, 123, 124, 125, 130, 156, 132, 136, 137, 143, 150, 156, 158, 160, 161, 162, 164, 165, 166, 168, 172, 177, 178, 179, 184, 189, 191, 192, 208, 217, 218, 219, 222, 225, 228, 229-15, 237, 251, 257, 280, 281, 282, 292, 312, 320, 325, 330, 331, 333, 338, 344, 357, 377, 391, 400, 401, 405, 410, 413, 425, 426, 440, 445, 497, 507, 510, 516, 518, 520, 540, 545, 562, 566, 568, 570. 602, 607, 609, 620, 653, 661, 665, 720, 739, 753, 771, 780, 790, 791, 792, 821, 830, 868, 880, 886, 890, 891, 897, 898, 899, 912, 943, 1078, 1079, 1200 M.S., 1233, 1403, 1404, 1867, 1910, 1921, 1954, 2120, 2720, 3701, 3703, 3947, 4527, 5000, 5001, 5012, 5028, 5112, 5114, 5271, 5701, 5274, 5590, 6004, 6156, 6218, 6248, 6343, 8093, 9772, 9775, 10414, 30625, 10050, 10069, 10490, 10990, 11245, 47303, 51095, P59, P112 is a multi face doll with two faces. 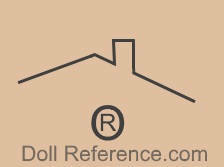 Note: There are probably more all bisque doll mold numbers, but this was all we have found so far. 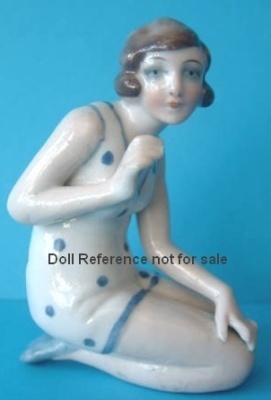 Also, most antique French all bisque dolls are unmarked, doll mold 1867 is a Bru.